Designed for continuous 24-hour operation right on your manufacturing floor, our high vacuum machines are ideal for processes which require stringent vacuum (<5x10-5 torr) and/or high temperature (up to 2200°F), such as the brazing of steel or nickel alloys with nickel. The main control unit is an industry-standard PLC. An optional web server provides full monitoring and control through a standard web browser. 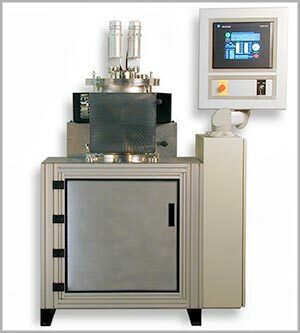 Parts are heated in a fully enclosed, stainless steel chamber with a controlled, inert atmosphere. Quartz viewports provide access for infrared temperature sensing. For automatic loading and unloading, a gate valve and linear sled can be added to the system. The chamber is mounted on a frame that houses all the required equipment for vacuum, atmospheric and system control, as well as the induction heating station. Real time monitoring and SPC are a snap with the RS232/485 interface, optional chart recorder and optical pyrometer; process conditions can be recorded and stored for each part. Power supplies up to 5 kW can be located underneath the chamber; more powerful models (7.5 to 120 kW) can be positioned up to 70 feet away and connected with flexible cabling. The 10.4" touch-screen display controls all aspects of the system and provides real-time feedback; the manual display is used for process development and troubleshooting. A keyed switch located below the display screen provides access to the process development and troubleshooting interfaces. To maximize operator safety, the heating system has been fully isolated. Safety interlocks protect access to the vacuum chamber and manual controls. A large Emergency Stop button is located on the operator interface; other warning systems are built into the software and hardware. For copper brazing of steel components, these machines use an innovative gas quenching system during the brazing process. This system maintains part hardness to your specifications and eliminates the need for secondary processes to restore hardness.